Bench Press Basic Setup, Mark Rippetoe from the CrossFit main site. Awesome article in the CrossFit Journal on GHD sit-ups (requires subscription). Congratulations to Joseph Phelan (5′ 11.5″) for passing his personal training exam this morning. Ross Enamait on jumping rope. 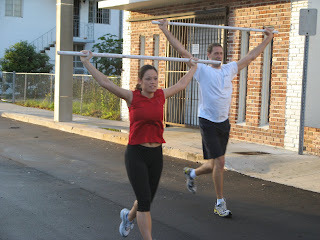 SEE YOU AT CrossFit 305 next Weds, 6/10.